choir croak out them goodies: The Discocks - Long Live Oi! 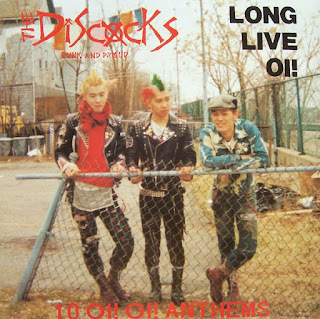 The Discocks - Long Live Oi! Hullo, friends. Post #480 brings something old and special from my record collection, one of many I've meant to digitize from vinyl for sharing purposes, but am much too lazy to do on a regular basis. Long Live Oi! was a near-mint record I stumbled upon at Rocket Records in Tacoma, WA, sometime in or around 2005. It's the first full length from the Discocks, an attempt at oi! that formed in Japan in 1992. Seeing as oi! was a subculture that stemmed from oppression in working class Britain, I more or less looked at this record as a cartoonish parody the first time I heard it; to some extent, not much has changed. Listen closely and you'll find yourself nodding along to lyrics like "Knock it back/and have another one/drinking and driving is so much fun" (from aptly titled "Drinking and Driving," which does its best to appropriate British pub culture). Give a hard listen to any other track and, well, the lyrics are more or less unintelligible through grumbly growls. But it's a dance party for one, and a damn good one at that. The Discocks would eventually split up and then reform with a nearly-new lineup, releasing Don't Be Fooled, Don't Be Satisfied, Don't Be Ruled...Don't Be Denied in 2005. Ohashi, their original bass player, went on to play for the Avoided and, later, 45RPM. Anyway, this record is apparently hard to come by in the U.S., and worth a fair bit of money on the internet. Lucky me! So, here. Lucky you!